Morning Glories: cake pops --so fun, so cute, so yummy! 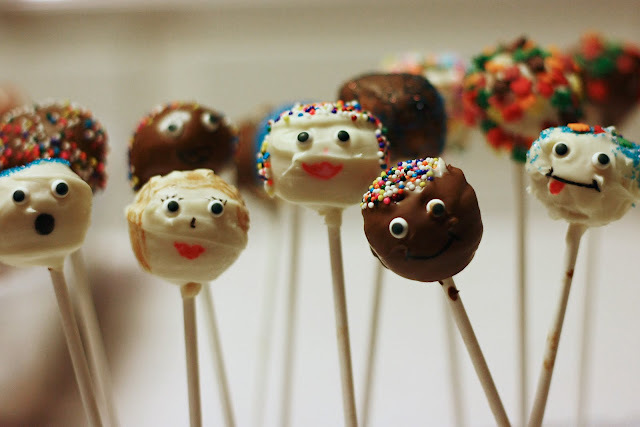 cake pops --so fun, so cute, so yummy! 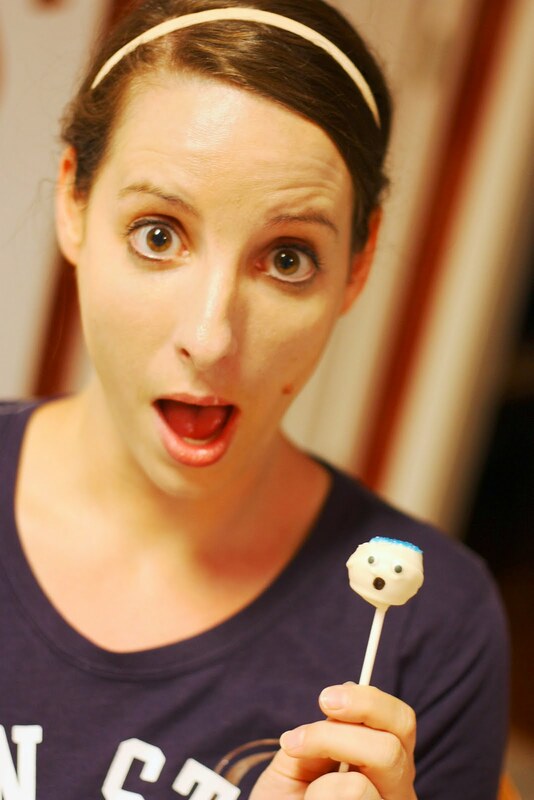 The super cute cake pops caught my eye a couple of years back when MckMama debuted them on her blog! I was definitely more interested in making them for photography purposes rather than eating them. After all, they are very pretty. Eye candy to me! However, after having my very first cake pop at Starbucks recently, I've fallen in love with them and have been dying to make them ever since! Since my sister has also been eager to make them, we declared a girls' night (to be had after the boys were in bed) and convinced my mom to join us in the festivities! I'm going to share how I/we made them, though they are very similar to MckMama's recipe, and thus Bakerella's recipe. I will make a couple of adjustments the next go around, but overall, they received good reviews (you know, from my mom, my sister and me)! I decided to get started prior to my sister and mom coming over, since the cake balls need to be refrigerated for a bit. So I attempted this after school, while all 3 boys were awake/playing/crawling into everything. That would be my first edit for next time. 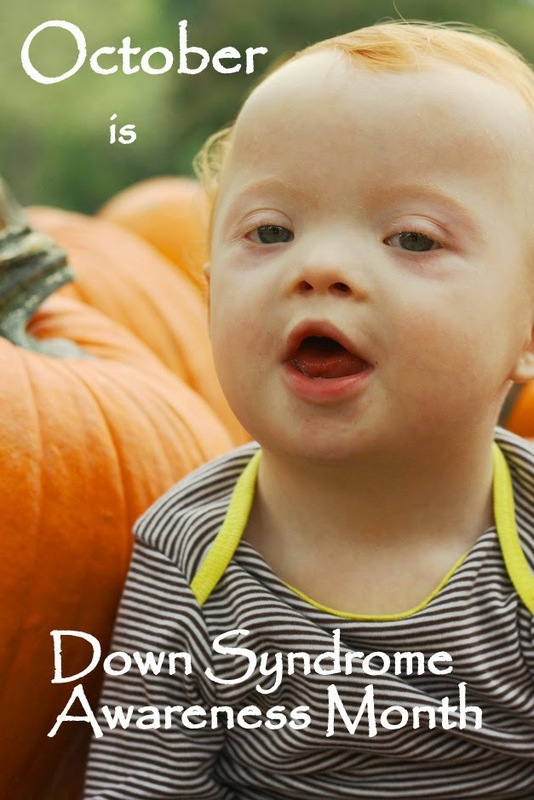 **Do not attempt to make cake balls while you have a crawling baby who has just learned to crawl up stairs, likes to play in toilets or your dogs' food bowl. 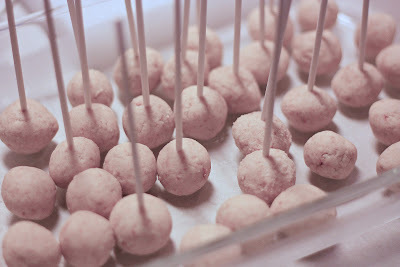 The cake balls are a messy endeavor and I found myself calling to my almost 6 year old many times for help!! Next time, I will make them after kids are in bed and chill them overnight! But I digress, here's how you start. . .
First, you bake a cake. Simple, right? Sure, though this was my first time to bake a cake. Ever. So, when it called for 3 egg whites, I was thrown for a loop. I called my friend and said, "What the heck?" and she told me to just throw in 3 eggs. Forget the separating. So I did. And, about 32 minutes later, the cake was done! Awesome and made our house smell delicious! Then, I let the cake cool--took maybe 15 minutes. Next, I started chopping up the cake with a spoon (our food processor wouldn't come on). Luke asked me why I was stabbing the cake! Ha! Basically, you just need to get the cake to very small pieces almost mealy looking. Then I started adding cream cheese frosting. Just scooped some in and stirred it around in the chopped up cake. ***This is my next edit. We decided I added a tad too much. I used about 3/4 of a can of cream cheese frosting. I think on my next go around I will use about half a can of frosting. However, you need enough to roll the dough balls. My recommendation would be to start slow. You can always add more, but it's impossible to take away. Once it's stirred together, I dug in. Literally. My hands were sticky and messy, but it's worth it! I made little balls about 1 inch in diameter. Some were bigger. Both worked fine. It took about 45 minutes to do so, although once my hands were goopey, was when all of my littles were needing something from me, of course! 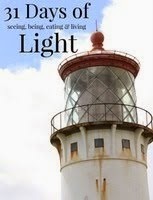 So, it may have taken less time if I wasn't stopping to help somebody with their craft, etc. After all the cake balls (at least 50 from one cake mix) were made, I chilled them in the freezer for 3 hours. They need to be chilled to keep their shape when you dip them in chocolate. Then the party began! Mom and Mary arrived and we began melting the chocolate in a double boiler while we put the lollipop sticks into the cake balls. **Be careful not to melt the chocolate too quickly. We had a pretty green color to use for some of the cake pops, but the chocolate got too hot too fast and turned to putty. It just didn't work. So, we melted the white and chocolate chocolate and began dipping the cake pops and having fun! We went crazy with sprinkles and designs and we even created a little town of cake pop people! Our cake peeps! Yes, we were a little delirious, my sister does that to me! She is hilarious and a nut case. See below. 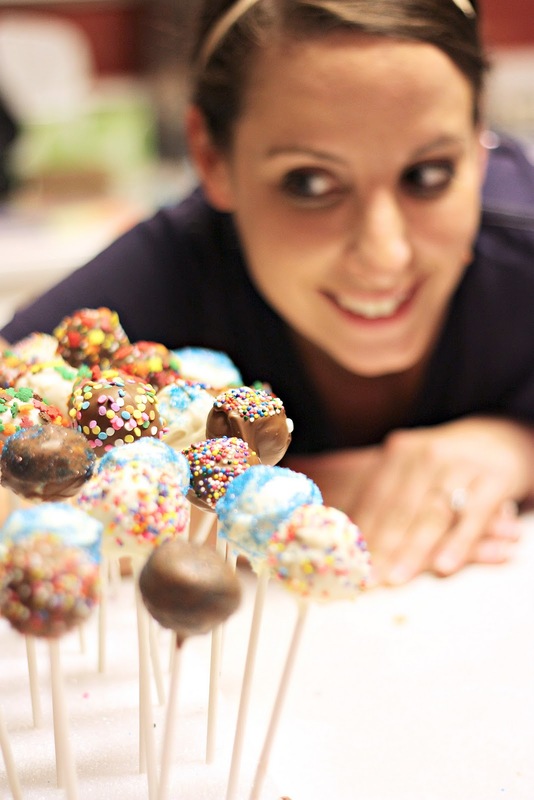 It was a great time and we are thrilled with our cake pops! For the first time around, we think we did a good job. And, with the edits I mentioned, maybe your first time around will be perfect! As I explained in greater length above, bake the cake according to box, crumbled up the cake, stir in the frosting, form the cake balls with your hands, chill them for a few hours, put in the lollipop sticks, dip into chocolate and decorate! Sooooo fun! Pretty to look at and yummy to eat! Have any of you made these? Any comments or suggestions to add? Hi! 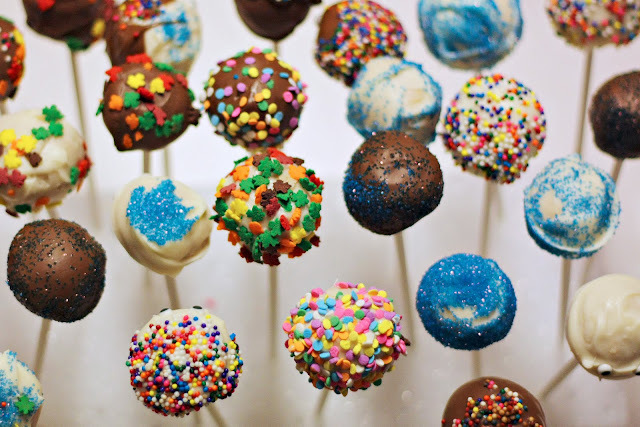 Those look soooo yummy! Where did you get the lollipop sticks? Hey Michelle---they were definitely yummy! Got the sticks at Hobby Lobby. Sure any craft store would have them--or candy/cake store!